These Chatty Fish Can Actually "Talk"
The Pearl Gourami is not only one of the most attractive gouramis, but also one of the hardiest and easiest to keep. It is also a Labyrinth fish, meaning that it is able to breathe by gulping air at the surface of the tank. Like some other Labyrinth fish, the Pearl Gourami can actually vocalize; don't be surprised if you hear your pet "talking to you" with growling or croaking noises (especially when breeding or fighting). This species originates in Thailand, Malaysia and the islands of Borneo and Sumatra. They prefer acidic water found in lowland swamps near the sea. Some Pearl Gourami have been introduced in Singapore and Colombia. It's rare to find a wild Pearl Gourami for sale as an aquarium fish; most are bred in captivity. Like others in its family, the body shape is elongated and laterally compressed. The ventral fins are long and thin and have the appearance of feelers. The mouth is small and upturned. Pearl and brown flecks covering the body give it a mother of pearl appearance, from which it derives its name. A horizontal black line runs from the mouth to the tail, where it ends in a spot. Pearl Gourami are generally peaceful fish that do well in a tank community. There are, however, a few exceptions to this rule: the males, in particular, may be aggressive of others of the same species (or other Gouramis in general). It's best to keep these fish with others of about the same size and temperament; they can also live happily with other small schooling fish. If you are keeping several Pearl Gouramis, a good grouping includes one male and several females. Accustomed to heavy vegetation in their natural habitat, Pearl Gouramis will thrive if given similar conditions in the aquarium. Floating plants, subdued lighting, and a dark substrate are ideal. Although they prefer soft acidic water, they are adaptable to a range of water conditions. 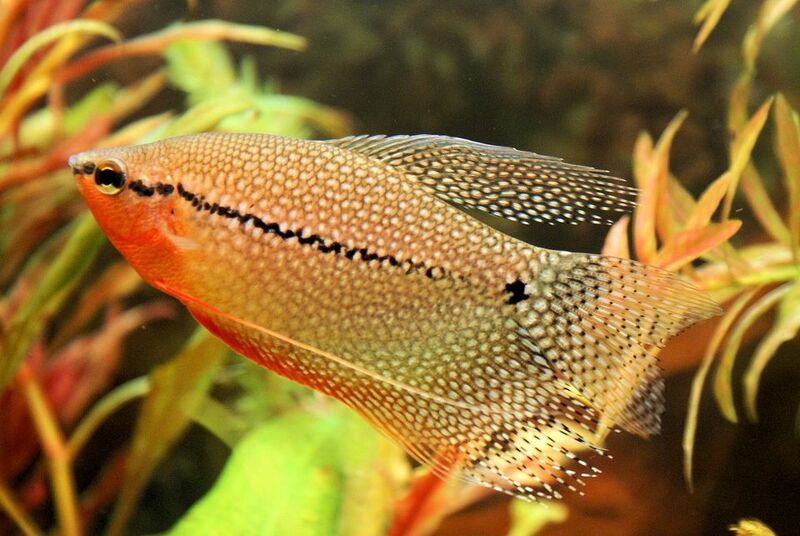 This adaptability and their peaceful nature make them well suited to community tanks. However, avoid keeping them with overly aggressive tankmates. Pearl Gouramis will accept many foods and are generally quite easy to feed. Flake, freeze-dried and frozen foods are all readily taken. For optimum health, offer fresh vegetables such as lettuce, cooked peas, and spinach as part of a varied diet. Live foods such as black worms, brine shrimp, and glass worms are a good treat and conditioning food for breeding. Male Pearl Gouramis have thinner, more angular bodies than females. They also have slightly different fins, sport a red breast, and are generally more colorful than females. Breeding is relatively simple. Adult males are easy to distinguish from the females by their deep red-orange coloration on the throat and breast. Another clue is the dorsal fin which is longer and more pointed on the male than the female. When ready to spawn, the female will have a much plumper body than the male. Prior to breeding, feed the pair live or frozen brine shrimp and worms for conditioning. Reduce the water in the breeding tank to a level of about six inches. Provide plenty of floating plants and raise the water temperature to approximately 80 degrees. The male will build a bubble nest, after which spawning will take place beneath it. When spawning, the male wraps his body around the female who will release hundreds of eggs. The eggs float to the surface where the male will tend to them until they hatch. After the eggs have been laid, remove the female as her role is complete. After approximately four days, the fry (baby fish) will be free swimming and the male should be removed. Feed the fry liquid food or infusoria culture several times a day. Offer freshly hatched (or frozen) brine shrimp at about two weeks of age. Fine flake foods may be offered once they are approximately one month old. Perform water changes every two to three days. As the fry grows larger, distribute them between several tanks to reduce the lethal build up of wastes. Poor growth or sudden loss of fry are often due to excessive waste.